Doubts Linger After Late-Night Deal On Bailout For Greece : The Two-Way Though other member nations of the eurozone put together a $170 billion rescue package, much more likely must be done to keep Greece afloat, experts say. 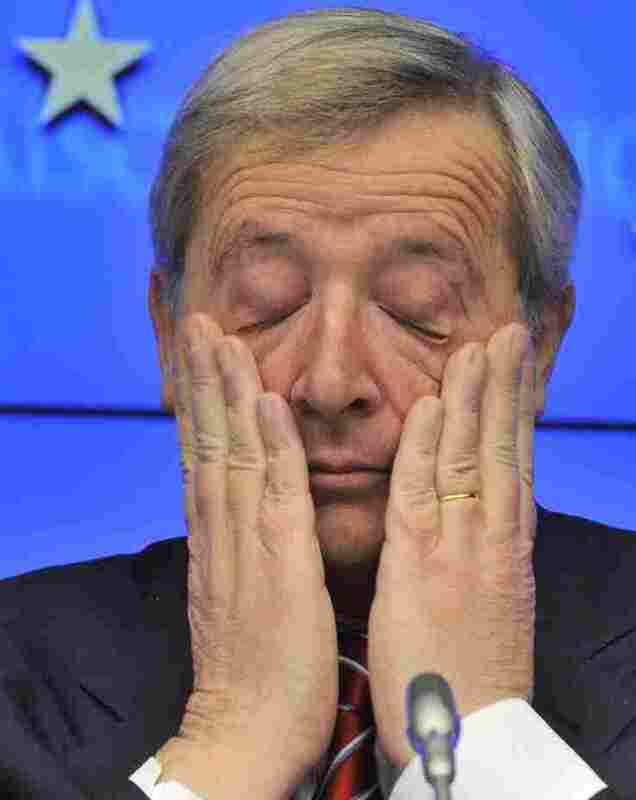 Luxembourg Prime Minister and Eurogroup President Jean-Claude Juncker scratches his eyes during a press conference following the meeting of Eurozone nations earlier today in Brussels. "The agreement was hailed as a step forward for Greece, but doubts immediately emerged as to whether it would do much more than deal with its most pressing debt problems. Greece will need more help if it is to bring its debts down to the level envisaged in the bailout and will remain "accident prone" in coming years, according to a deeply pessimistic report by international experts obtained by Reuters." "Attention is now turning to what happens next. The medium-term outlook is bleak. There is a growing consensus among pundits that the only real clarity is that there will be more uncertainty. Jennifer McKeown, senior European economist at Capital Economics, goes as far as to suggest Brussels' worst fears could yet materialisze: 'With the recession thwarting debt reduction efforts and public outrage growing, we still see Greece leaving the eurozone before the year is out.' "
On Morning Edition, NPR's Eric Westervelt reported that "the deal now hinges on persuading enough private bond holders to take even bigger than expected losses on Greek debt and for Athens to commit and implement deep [budget] cuts." As we've been reporting, many Greeks are very upset about what the austerity measures mean for their lives. Shoring up Greece is critical, experts say, because if it defaults that would put pressure on some of Europe's other financially troubled nations.